If you’re a parent, it’s likely that you remember having the chickenpox, or, at the very least, you know someone who has had it. But since we’ve had children, a vaccine has been made for chickenpox. Licensed for use in the United States in 1995, the Advisory Committee on Immunization Practices recommended that all children receive the vaccine. It was shortly after that the Kaiser Permanente Vaccine Study Center began their research on the effectiveness of the vaccine. Based on 14 years of data, the Kaiser Center followed 7,585 children who were between the ages of 12 and 23 months at the startup of their study. Their goal was to determine the long-term effectiveness of the varicella vaccine against both chickenpox and shingles. They also looked at the results of adding the second dose of varicella, which became available in 2006. 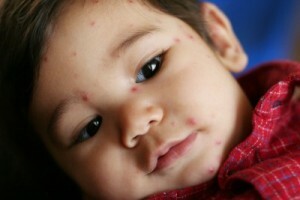 Prior to the vaccine, over 90 percent of adolescents ended up with chickenpox before the age of 20. Over the length of the study’s follow-up period, children from the study were 9 to 10 times less likely than children before the vaccine to contract varicella. A total of 1,505 breakthrough cases were reported (“breakthroughs” are when a child contracts the disease even though they’ve been vaccinated). Overall, researchers said the vaccine provided a total rate of effectiveness of about 90 percent. Regarding the varicella vaccine and shingles, researchers noted there was a 40 percent drop in reported cases. Previous studies would suggest that Baxter’s theory is correct. One study by the CDC, released in 2011, found that the vaccines helped protect small infants when they were surrounded by already vaccinated children. A Yale University study from 2011 found that double doses were more effective than just one. And a study from the National Center for Immunization and Respiratory Diseases from 2011 reported that chickenpox may soon be completely eradicated in the United States; they found that deaths from the illness since the vaccine have been slim to none.